Discussion in 'GS Boxers' started by JimVonBaden, Nov 27, 2007. 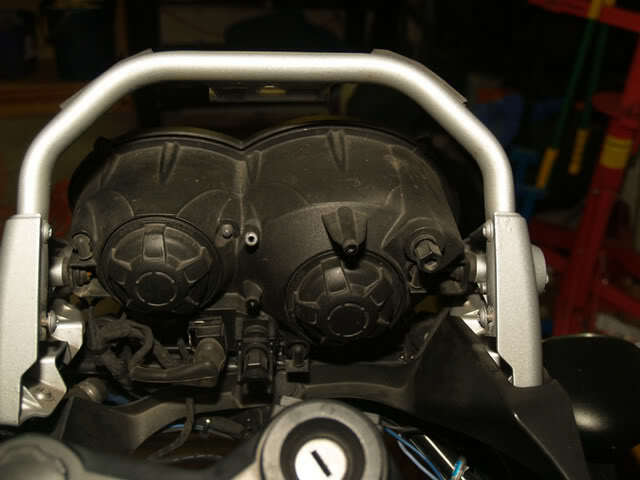 After many many promises, I decided to do a short pictorial on how to install a set of HID lights in my R1200GS. This pictorial is done with lots of extra parts removed for clarity. I wont be telling you what tools to use, or torques. This type of pictorial doesnt lend itself well to it, but you should easily be able to do what I did. Here are the lights in the box. Mine were the fat ballasts, with the igniters built in. I have done the ones without the ballast built in, and they are definitely easier to mount, though basically in the same place. I removed the instruments for the job to make it easier to see, but it is definitely not needed. Here are the High (left) and low (right) covers. Just pop the caps off by twisting them counterclockwise. 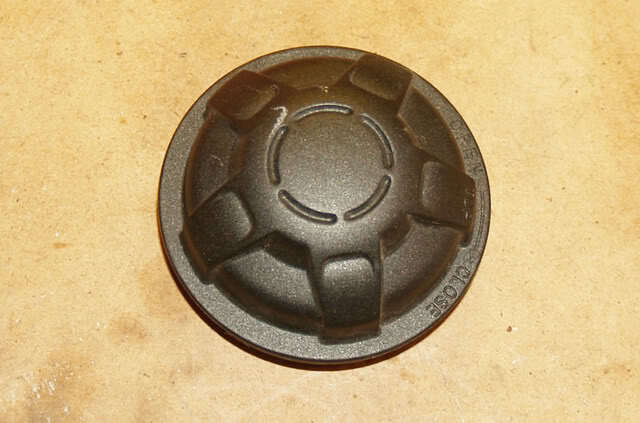 Here is a cap before drilling the 23mm hole. I used a Dremmel tool to do mine. 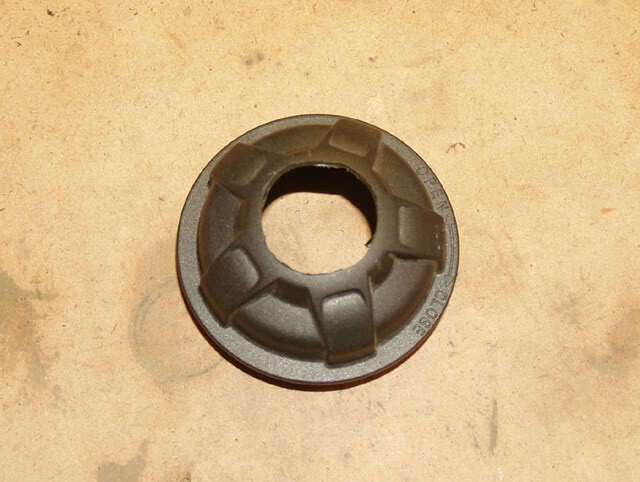 Here is the same cap after removing the material. Interestingly, it is exactly the same size as the indents in the caps. I bet you know why? Simply push the wires through the hole, then pull the grommet in place. They recommend adding some sealant, but I didnt. I figure they will seal just fine as is. Here are both of them mounted. The wiring looks clean and secure in the caps. Here is the right ballast mount. You can see it went to the screw holding the oil line. This is the other mount, shown to illustrate the original shape. I bent it with pliars. Now you can see it is a tight fit with the beak installed. But it is clean. I added some tie straps to secure the ballast to the mount, and firm it in place as well. The right ballast fit in, and cleanly. With everything put back together, and the wiring secured, it is nearly invisible. On the left side, the ballast goes into the same place. It is a tight fit, and you will have to play with it a bit, but it will fit. The slimmer ballast would have the advantage here. Low HID. Clean white, but not too blue. This is the 4300 kit. 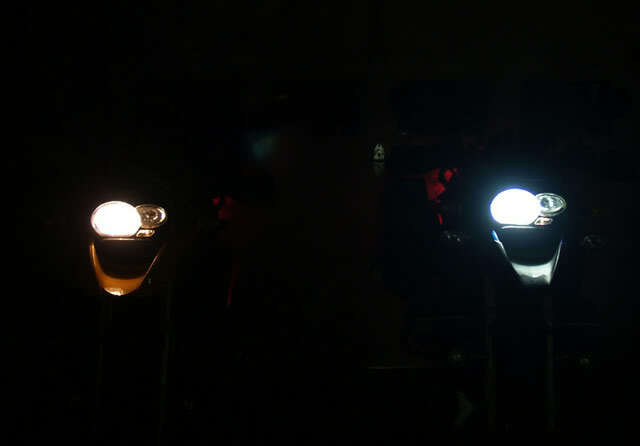 I then added a second GS, with Motolights, and compared them side-by-side. 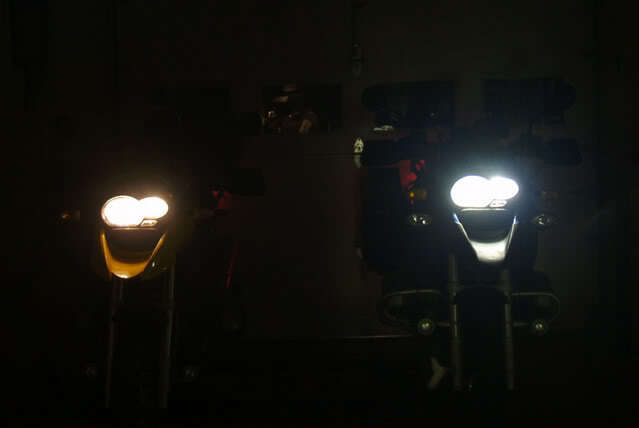 Note that the bike on the left is completely stock with 35 watt Motolights. 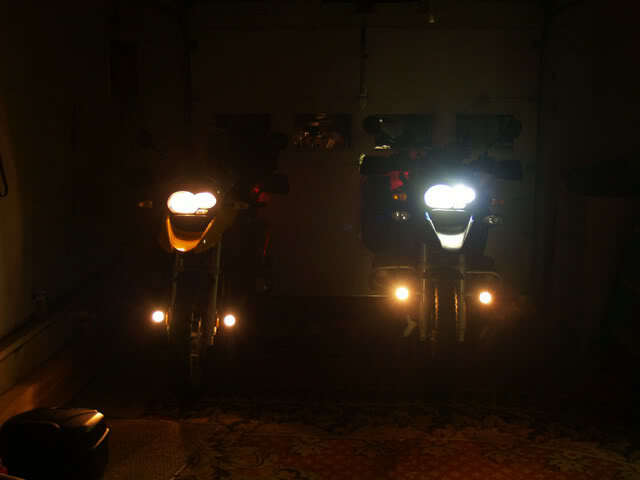 My bike has both HIDs, and 50 watt Motolights. Low beam, you can see the difference here. High beam, even more obvious. 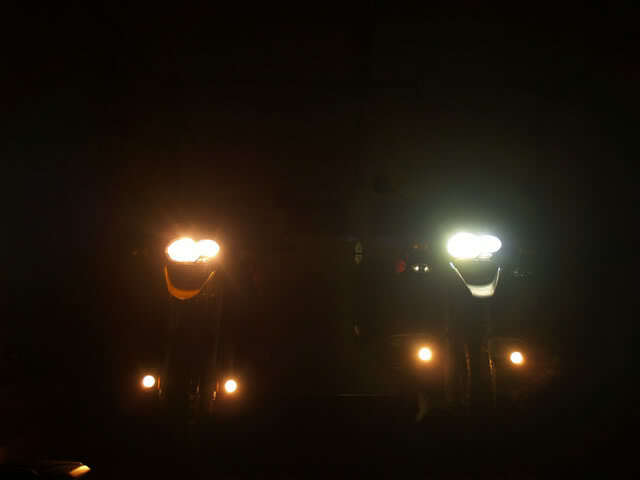 Both bikes with Motolights and High Beams. It seems obvious to me, especially after riding at night, that the HID lights are definitely superior, and not as susceptible to dimming at idle with Gerbings and Servos going. 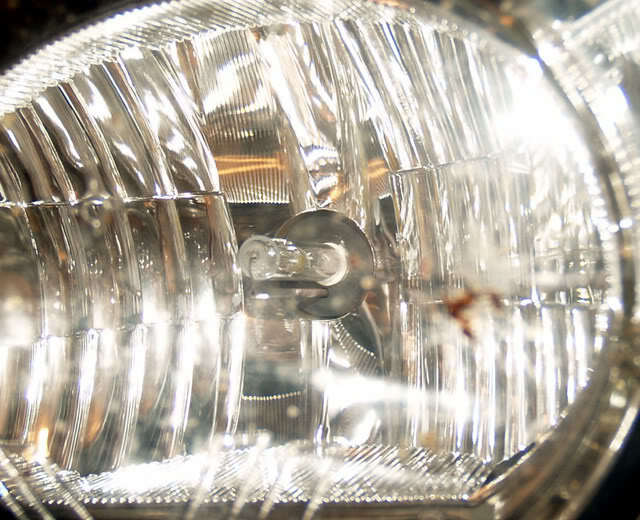 Here is what the bulb looks like installed in the low beam. Dont forget to keep the old H7 bulbs, just in case. 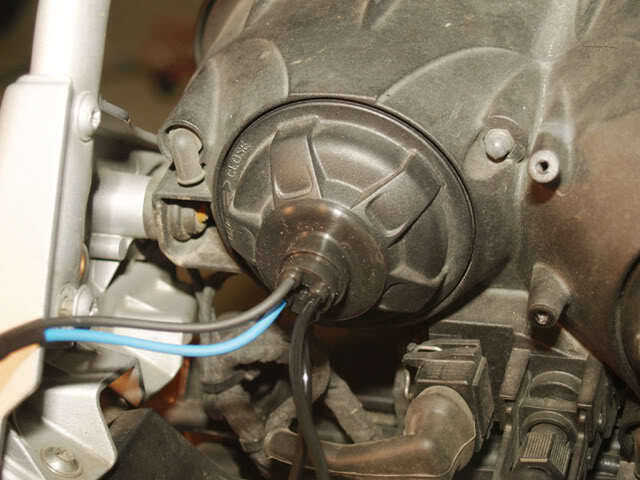 This procedure is completely reversible, and if an HID goes out, you can swap in the old H& in minutes. and not as susceptible to dimming at idle with Gerbings and Servos going. Presumably, that's their reduction in draw vs. the halogens, but ... that dimming at idle on the halogens, in theory, was also shortening their lifespan (I wonder if there was a connection between voltage drop at idle and the H7 bulbs you folks have gone through). The filament has to burn at a certain heat before the halogen gas forces the suspended particulate matter back ON to the filament, increasing its lifespan. If that cycle breaks (voltage drops), the lifespan shortens. I have done a HID conversion on my 1200, but only the low beam, I realised straight on, the low beam is to bright for everyday use, it irritates drivers in front of you, also because the 1200 headlight just sits high enough to reflect right into a cars rear view mirror, people were constanly adjusting their rear view mirrors. Subsequently have moved it to the high beam and still having a normal H7 globe in the low beam. How do the electrics work? Are your HIDs drawing straight off the battery, or are they hooked up solely to the wires for the stock lights. If so, what did it take to adapt the plugs? and... do your lights come on before you hit the start button? 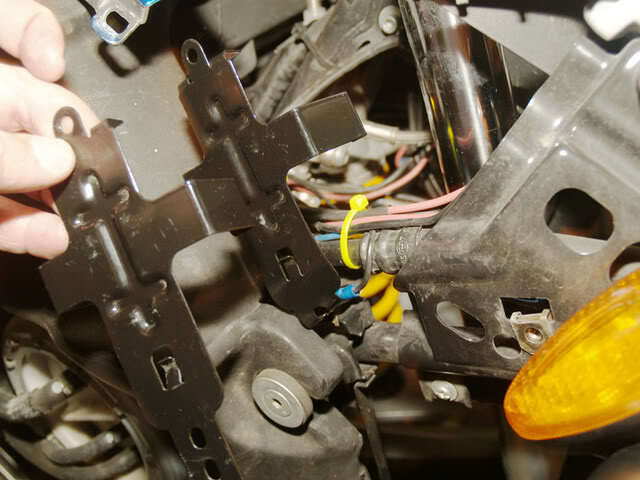 At least the new kits draw their power off the OEM headlight wiring. Its a 100 percent plug & play other than drilling out the cap like Jim did and other than having to mount the ballasts. IMO the new thin ones are worth the extra bucks. I really like that its so easy to reverse, even along side the road, should your HID or ballast ever crap out. I haven't found the low beam too irritating to other drivers after a couple of adjustments on aiming. From who did you buy your kit? As mere mortals, we would be lost in the wilderness without the sage wisdom and "wrenching skills" of the Grand Master....and then he shares so unselfishly. Is He Good or What?? Naturally I'm talking about Jim V.
So who has put HID's in their aux. lights? My low and high beam HID's are 6000k. I think I want a contrast color in my Hella Micro DE's when I get them. I'm thinking of 3000k HID's them or maybe just amber H3 filament bulbs. Just FYI: If you don't have servo/ABS, you can stash the ballasts under the tank, there's a lot of space there!! 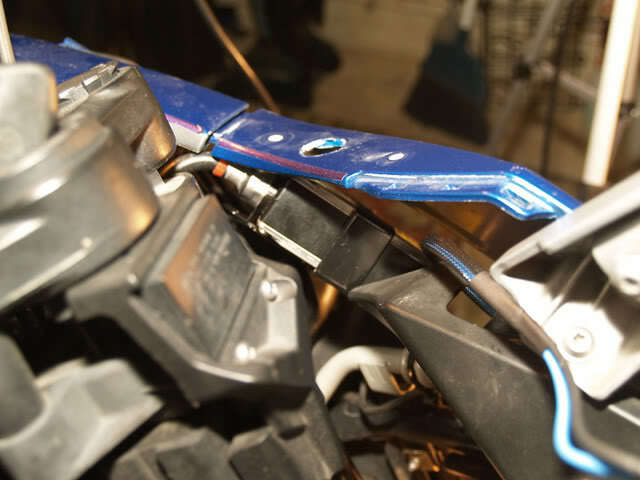 Were you able to get your accessory plug on the beak back in after the ballast install? 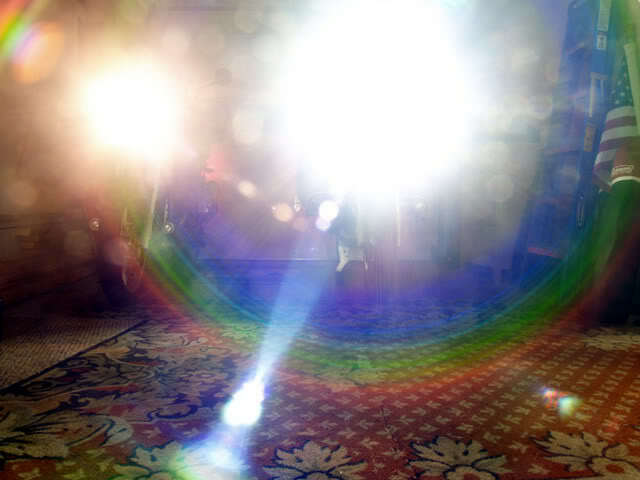 So are you getting a High Beam and a Low Beam - or do you now have two of the same? 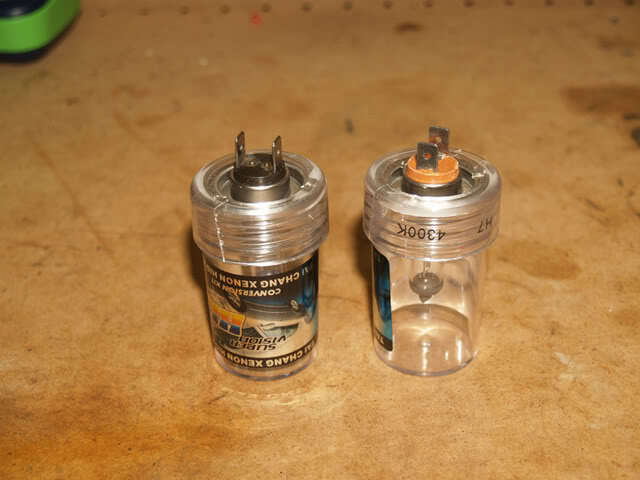 Both are H7 bulb kits, no high or low specific. The reflector in the housing does the high and low reflecting. High beam HID is not recommended if you like to use the flash to pass feature of the control switch.. which something Europeans use, but here.. people don't understand it.. They think you're flipping them the bird. rideLD The further the better! Very interesting theroy. I think you are on to something there. 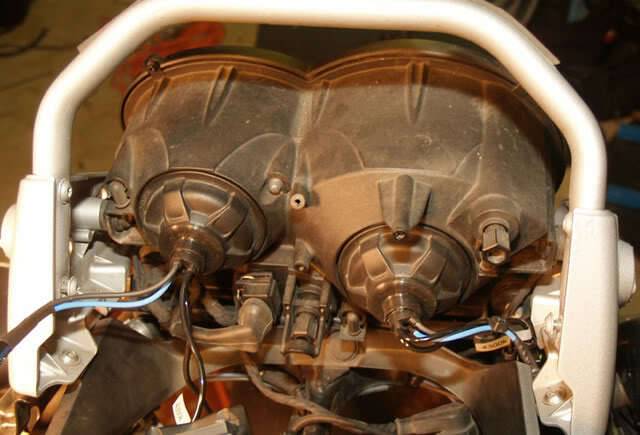 My 05 R1200GS would burn out a bulb about every 7 thousand miles. If your theroy is correct the 07's would be more resistant to this because the light will not dim as much at idle without the power brakes. I switched my 07 to HID at about 2000 miles so I'm not one to ask. I would say to do a poll but they never work out to be very accurate because some from Orange Crush always come over and vote for failures. Rick has it right, in theory. I used the H7 in both high and low beam, no extra wiring, just plug into the stock light circuit wires that go to the halogen lights, and run your wires back and forth to the remotely installed ballasts. They work fine, no fault codes, on the stock circuits. Though many have said that the H7 in the high beam position wont work for flash to pass, they work fine on mine. The high beam doesn't get up to full power in the .5 second on time, but it gets easily as bright as stock, and works fine for flash to pass. There is one possible concern with the high beam HID. IF you start the bike with the high beam on, it will go out when starting the bike, and come on with the low beam after starting. The initial surge of boost power can reset your clock and trip meters. I tried it on mine twice without that happening, but a low battery, might cause it. I have a local friend who has had it happen a couple times. 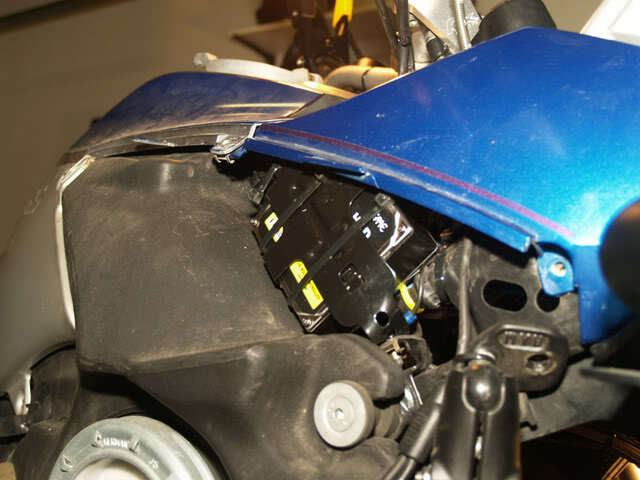 The load relief relay causes the high beam to go off, the low beam wont come on until after the bike starts, and they both come on at the same time if the high beam is on. The large ballasts are a snug fit, so if you have a Stebel horn and ABS, you will have to either fit them like I did, or make a bracket that fits under the oil cooler to mount them. Since I didn't have the materials for the bracket, I mounted them as you see. It precludes the use of my accessory socket. 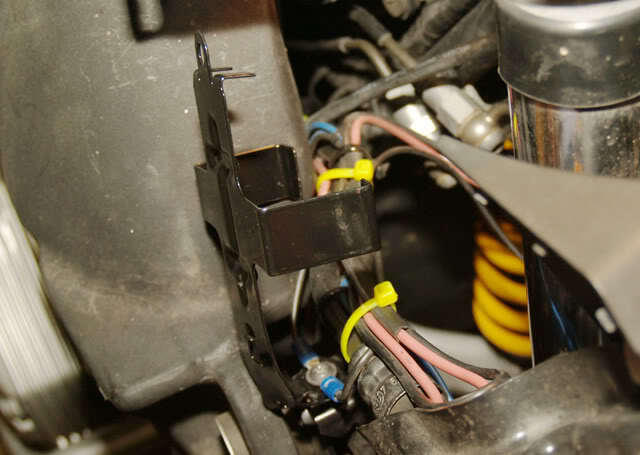 I will, however, be building a mount under the oil cooler, and if you have a GS Adv, or a light bar already there, you have an alternate mounting location. 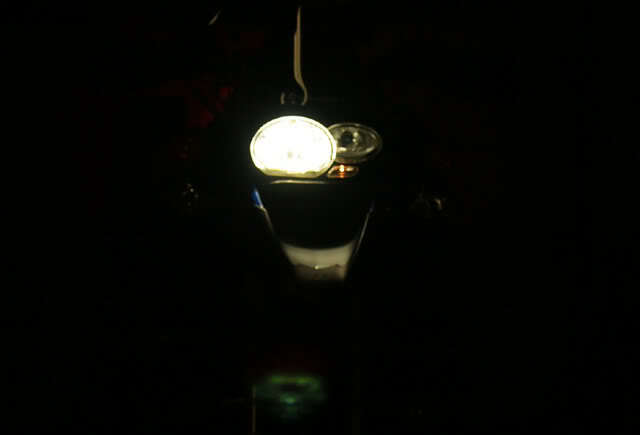 Recently I have been using my high beam a lot during daytime riding and also have it on when I start the bike. I get no resets or faults, but just that real high pitched whine like when you're charging up a camera flash and then it goes away after a few seconds. 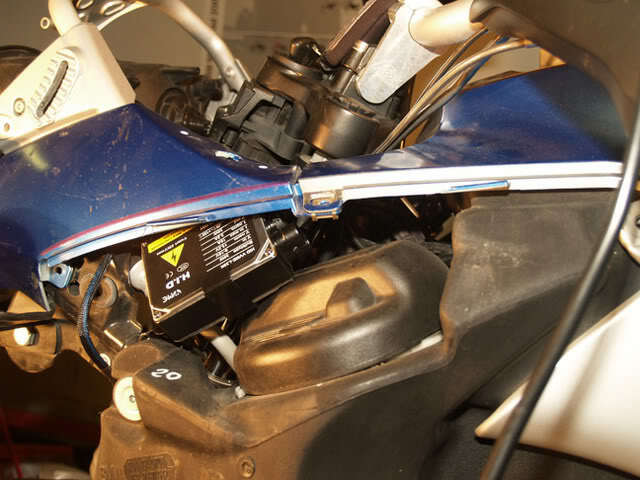 Make sure your high beam works, even if you rarely ride at night. I had my low beam go out on an onramp to the Garden State Pkwy. at about 11:30pm with 250 miles to get home. No way could I pull over there, so I just switched to high beam and was fine until I could stop at a gas station. Low came back on after I restarted the bike. Jim, thanks for the great info! I've been doing some research on lighting, and as it turns out what I've decided on is going to be pretty much exactly what you have. Maybe I should have short-circuited all that research and just copied you straight away. I have a small favour to ask... Since those look like Hella FF50s, could you post a photo from the front of your bike at what it looks like when you've got the FF50s lit as well? Also, do you have those on a separate switch that you can have on whether you are in low beam or high beam? How do you have that set up? Last question... you make reference to the fat ballasts vs the thin ones. 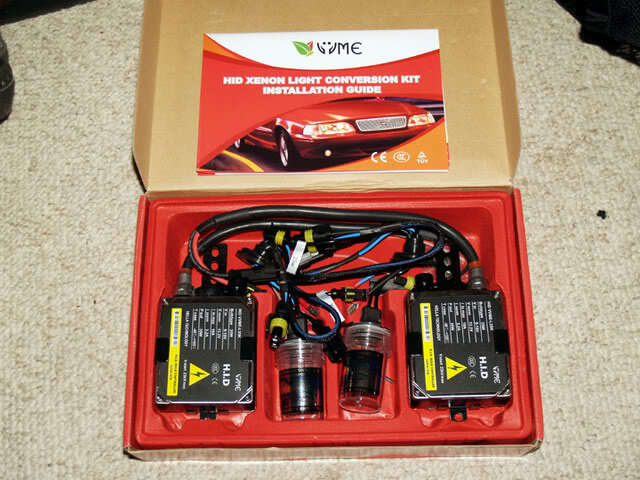 Is there a VVME kit with thin ballasts, or are you referring to one from a different manufacturer?